Click on the thumbnails below for full-size images and for more information. It was the home for many years of the Whieldon family; Bedworth pit owners and related to the Stoke on Trent area pottery owners. Springfield House was owned by George Whieldon a member of the famous pottery family of Stoke on Trent in the early 19th century. It is believed that the House was built in the late 18th century, though this in unconfirmed. George Whieldon owned Hawkesbury Colliery and used the house as offices in addition to living there. 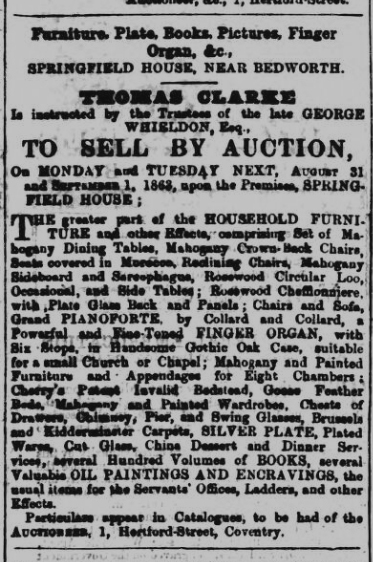 George Whieldon died in 1863 and the House contents were auctioned off (see auction notice below). Sometime after this it was split into four individual dwellings one of whom was occupied by Joseph Sexton cashier of the colliery, and it continued its relationship with Hawkesbury Colliery until the house was demolished just before the Second World War, around 1937-38. 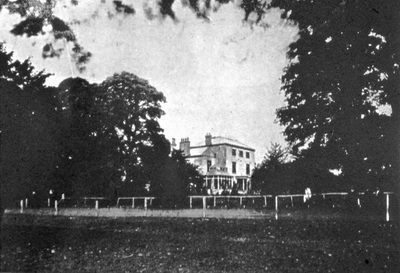 Springfield House was one of Bedworth's three halls: Bedworth Hall (demolished early 1870s) and Saunders Hall being the others. Saunders Hall was still in existence in the 1920s is believed to have survived until the 1950s.